witness Tim Plewman in Greg Viljoen’s The Last Moustache. 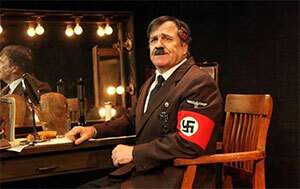 Offering an alternate ending to the fuhrer’s reign of terror, the play centres on a German actor, Heiner Schmidt, who has been coerced to play the part of Hitler after the real dictator was successfully assassinated in 1944. Set in a ‘rehearsal bunker’, Schmidt tells his story – a blend of humour and historically realistic insight – while above ground, muffled mortar fire falls ahead of the advancing Russian army. The play’s proximity to the truth lends it weight whilst serving to highlight the absurdity of the Nazi era. Plewman portrays a number of characters, from a sometimes-dancing Hitler to the nefarious Joseph Goebbels with a wonderfully sick sense of humour. He embodies petrified German sycophants and even Hitler’s partner, Eva Braun. Plewman skilfully maintains the wickedly clever narrative, slipping seamlessly between roles. It’s easy to forget Plewman is alone on stage, and the high energy, suitably hammed-up characters give the tale a surprising amount of depth, incongruent with the hilarity of the action on stage. Suspense is kept high: an intercom blares out reminders of the impending scorched earth above. Plewman’s character keeps reminding himself that he should be grateful for having a way out, though there is the underlying repulsion in the the things he is being made to stand for that threatens to overwhelm him. As he spins out his story, the situation becomes gradually clearer, the nature of it slightly more sinister. The internal moral conflict could benefit from coming to the surface a little more often. It’s culmination is not lost on the audience, yet it could be truly powerful if carefully cultivated earlier on. Nonetheless, this is a great piece of theatre. It’s fresh, creative and slickly executed, wildly funny with a hint of something curiously morbid. The Last Moustache runs at the Baxter Theatre’s Golden Arrow Studio 4 to 14 November 2014.